I’m a big fan of all things French, and that definitely stretches to the food and wine. Le Maquis is my favourite spot in Zurich for delivering that French flair in abundance. I love going here for a relaxed dinner with friends or my husband, and also drop by in the mornings and afternoons for a cup of their excellent coffee and a croissant. As soon as you enter, you are greeted with a big smile. The dining room is cozy, with wooden chairs and tables, and has the feel of a real French bistro. They do well by not cramming in too much furniture, so it doesn’t feel cramped. Although the wine list is very small at the moment (three whites and three reds), they are happy to let you taste them all before you choose, and none of them is a bad option! As for the food… Everything is divine. 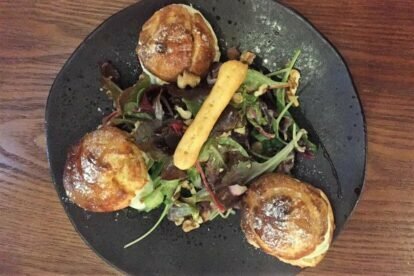 I highly recommend the fish soup (which brought me right back to my trip to Marseille last year), the profiteroles filled with goat cheese (see photo) and the divine ‘hirsch’ (stag?!) stew with tagliatelle and celery puree. Everything tastes spot on and it’s great value for such high quality food in Zurich.